Ford’s F-150 Raptor is getting ready to travel….well sort of. Ford recently announced that the truck will available in China in 2017. F-150 Raptor is unique among off-road performance vehicles, with a purpose-built engine, chassis and suspension – all of which enable it to travel fast over challenging desert landscapes or crawl over rocky terrain, from Baja to the Gobi Desert. China will get to experience the F-150 Raptor and experience all of the advanced materials – including a fully boxed, high-strength steel frame and high-strength, military-grade aluminum-alloy body – help to improve durability while greatly reducing the weight of Raptor for improved off-road prowess. Combined with all-new EcoBoost engine technology, F-150 Raptor SuperCrew has a power-to-weight ratio that makes it even more agile off-road. F-150 Raptor is powered by Ford’s new, second-generation high-output 3.5-liter EcoBoost that produces more power with greater efficiency than the previous Raptor’s 6.2-liter V8, which was rated at 411 horsepower and 434 lb.-ft. of torque. 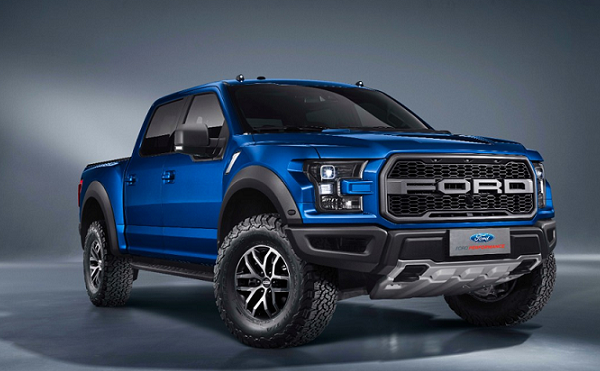 An F-150 Raptor exclusive, the engine is paired with an all-new 10-speed transmission for improved efficiency. Print article This entry was posted by Art Eddy III on April 23, 2016 at 4:49 am, and is filed under Cars. Follow any responses to this post through RSS 2.0. Both comments and pings are currently closed.